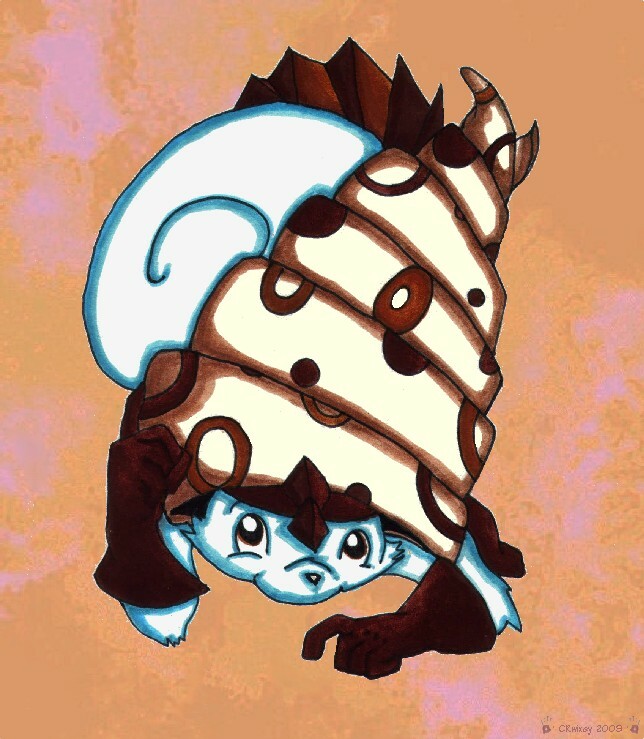 The name's derived from the words squirrel and kara, Japaense for shell (as in nut or egg shell, not sea shell). Squirkara are timid little fellows who conceal themselves beneath a gigantic origami shell. Luckily it’s waterproof, so they aren’t averse to snooping around fields and forests during the odd shower. Squirkara are strange in that they’re too shy to remove their shells, and think themselves well hidden and protected, even though their tails are permanently on display because the shells aren’t big enough to conceal them. If threatened, they fling a paw full of mud to protect themselves, then beat a hasty retreat while the "threat" is trying to wipe the muck from their eyes. Date Submitted May 17, 2009, 3:48:12 PM Time Taken Around two hours. I promise, I'll get on to your Pokemon next, I've just finished an Eeveelution I should have done ages ago. aww! I love it! hermits are amazing! you sure it's the FINAL evolution? I mean there's like 200 of these guys. Well, there's only about 12 squirrels... six grey and six white... although I might do another two at some point.